I recently wrote a love letter to my allotment. It was an homage to my little patch of ground that had, in less than 2 years, come to mean so much to me. Its not perfect but having the space to grow my own fruit, vegetables and cut flowers had made a such a difference to my life. The saying goes ‘you can’t put a price on happiness’ and yet something happened at the weekend that made me look at my plot in the cold-hearted terms of money. On the way to the allotment on Sunday morning I bumped into a fellow plot holder and we got chatting about the weather, his asters and his Sunday lunch. Just as we were about to say our farewells he remembered something. ‘They’re putting the price up of the allotments, you know’, he said. I didn’t. He went on to say that they would be charging by the square metre, a £1 a square metre and that he had already told them he would be giving his up, as a result. My own plot, classed as a full size plot, is 20 metres by 7 metres and I currently pay £10 a year. Compared to rents across the country I know it is extraordinarily low but it got me thinking, just how much would I pay for my beloved plot and what would others consider an appropriate charge. Some of the most expensive plots in the country cost over £150 a year and I would be willing and able to pay this for renting my plot, although I would want a justification for such a price rise and would expect more facilities in return. But for those living on a limited income of a pension, which make up the majority of other plot holders at my site, I’m guessing that this would be a prohibitive amount. Then there are those who choose to pay the £10 a year so they keep hold of their plot but do very little with it but it doesn’t really matter to them if that £10 has been wasted. They might think differently with a significant price rise. This might not be such a bad thing if it routed out those who take up plots when they aren’t that bothered about them. But I did wonder whether there would be anyone, other than me, who would consider paying any sort of price rise let alone £1 per square metre. The idea that this might be a cunning plan to get everyone off the plots to sell off the land crossed my mind. Would I be the lone person defending my plot as the bulldozers came in? There seems to be such variance across the country in the rent charged by councils for allotments. A study by the University of Leicester in 2011 which gathered data from allotment sites in England found rent charges ranged from 1p to 55p per square metre, with the average plot measuring 250 m2 and costing 15p per square metre. The 1950 Allotment Act states councils can only charge ‘at such rent as a tenant may reasonably be expected to pay for the land’. That’s clear then! There is also such a difference in what is offered in return for the rent. Some plots have water, toilets, communal sheds, storage facilities, deliveries of compost and bark chippings. My own allotment offers water on tap but nothing else but that’s fine as I only pay £10, I would expect to pay more for any other amenities. Steep price rises have become common place in recent years with doubling, and even tripling of rents not unusual. Canterbury City Council proposed that a full plot for 2012/13 will cost £104 compared to £52 in 2011/12. The justification for rises such as this, across the country, is that councils are having to find ways of managing their budgets in the face of massive shortfalls in funding from central government. Are allotments now being seen by councils as cash cows rather than a subsidised facility that were never intended to supply councils with funds? In places with long waiting lists maybe councils feel they can get away with charging more but it’s a risky strategy in other places. You won’t raise more money if everyone gives up their plot. For me, having an allotment was never really about saving money by growing my own food but for some of the older plot holders it is. 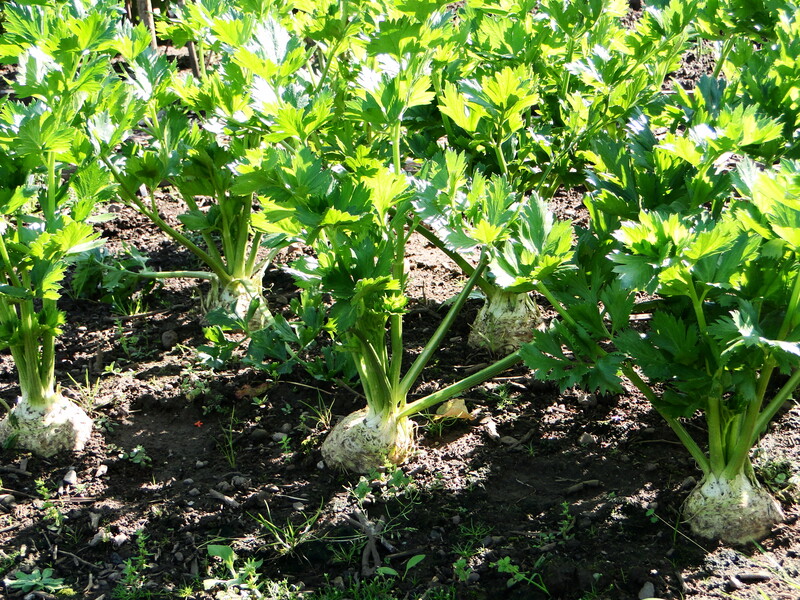 Many of them grow staple crops such as potatoes and onions in large enough quantities to keep them going through the winter. Any significant price rise will wipe out any saving they are making and I suspect they would no longer be interested in having a plot. In the days before allotments had become popular there was a dearth of plot holders in my village. As a result some of the regulars acquired more plots which they still have today, despite there being a waiting list. Pricing them out of having more plots on the face of it would seem only fair. The down side is these regulars are the ones who really do look after their plots. Of course, all I had heard was a rumour, the rest was my imagination running away with itself. The allotments in my village are the responsibility of the parish council and are managed by the parish clerk. So to see if I could find out the facts I gave him a ring. I can’t say I came off the phone feeling any clearer about what I’ll be paying for my plot. There are quite a lot of different sizes to some of the plots and it has been deemed unfair that the charges don’t reflect this. Apparently, measurements have been taken and letters will be issued to clarify who rents what. I can think of one plot holder, in particular, who has three large plots, who will be particularly affected. The rent will go up as a new charging structure is introduced but this has yet to be decided. Only time will tell what others are willing to pay for their plots. After years of being used to, what is admittedly very low rent charges, it’ll be interesting to see who will be around this time next year. I do hope it’s not just me. How much would you be willing to pay for your plot? Since having my allotment I have to admit my passion for productive growing has taken over my interest in ornamental gardening. So much so, that I’m always slightly disappointed if I visit a garden and it doesn’t have a veg patch for my perusal. The idea of kitchen gardens has always fascinated me. The first type of kitchen gardens were probably those created by the monks in the grounds of their monasteries but they were at their peak in the Victorian and Edwardian periods supplying large houses with all their fruit, vegetable and flowery needs. They went into decline fairly rapidly during the First World War as the men who worked in these gardens were called up to fight, and they never really recovered, that is until the last decade or so when their potential has been rediscovered. Not only are old kitchen gardens being restored but new ones are being created. I’d heard of somewhere local to me that had embraced the idea of establishing a new kitchen garden and I was really intrigued. Even better, the owners agreed to have a quick chat about their project. The Bell, a 17th century coaching inn and now a restaurant with rooms, in the pretty village of Skenfrith, is a great example of the food revolution that has taken place not just in Monmouthshire but across the country. Celebrating local producers is the ethos behind the food served in the restaurant. This, in itself, is no longer that unusual but what does make The Bell different is that it has taken its interest in food production to another level. It had always been the dream of owners William and Janet Hutchings to have a kitchen garden that would produce organic, fresh and tasty produce for their chef. The dream became reality over 7 years ago when Helen Westendorp of Essence Garden Design took William’s ideas and sketches and translated them onto the fields behind The Bell. Raised beds were created and an irrigation system, fed by a spring, was installed by William. Initially, it was very much a learning process experimenting to see what worked. 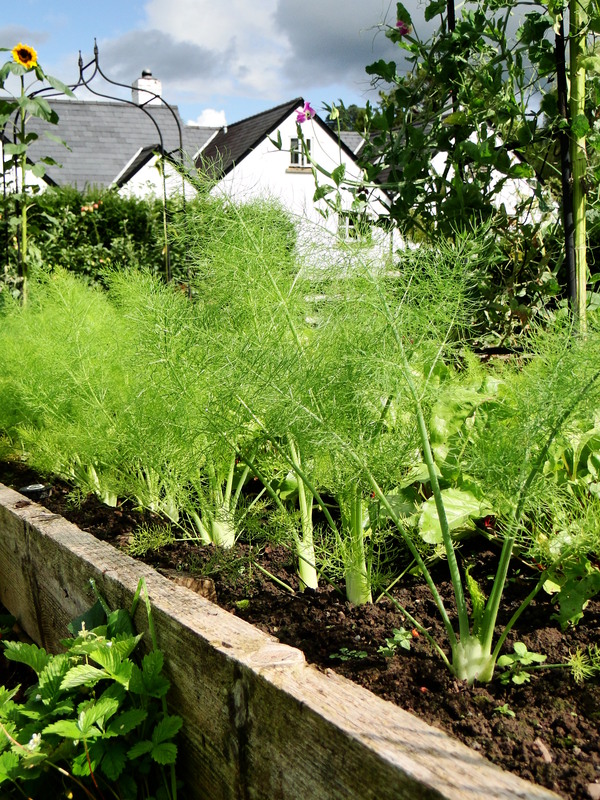 They discovered their raised beds were much better utilised for baby veg than the perennial vegetables, such as rhubarb and asparagus that they planted at first. Of course, all gardeners know how addictive growing your own is and it wasn’t long before the kitchen garden had extended into neighbouring fields. 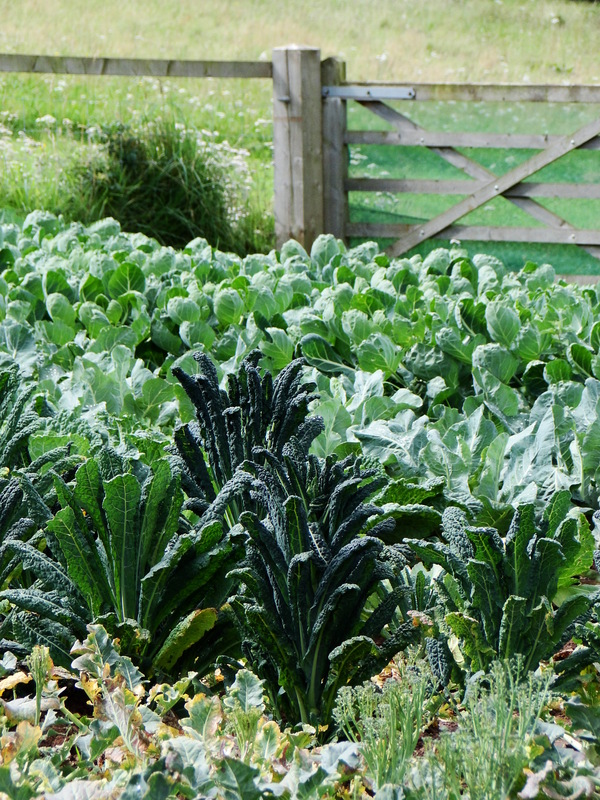 They moved away from raised beds as they realised the quantities they needed to grow of crops such as leeks and brassicas were more practicable in open ground. Espaliered apples and pears were planted along the boundaries but it was the addition of two polytunnels that have made the biggest difference to what they can grow. With Candi Smith as their new head gardener they are experimenting with heritage tomatoes and aubergines. The tunnels have also been invaluable in allowing the gardening team to extend the growing season. In fact, Janet explained how they have actually acted as a natural larder, allowing them to pick baby vegetables throughout the winter whilst the ground outside was hard with frost or covered in snow. Once a year, William and Janet sit down with their chef and gardeners and plan what to grow for the forthcoming year. Baby vegetables of crops such as leek, beetroot, carrot and turnip are particularly popular with the chef, as are herbs, edible flowers and unusual varieties which are otherwise difficult to get hold of, like Pink Fir Apple potatoes. Every week they create a kitchen garden menu using whatever is in peak production at that time. Last week, for instance, there was a courgette and mint soup, a curry using runner beans, green beans and peas and a variety of side dishes including beetroot and home grown salad leaves. 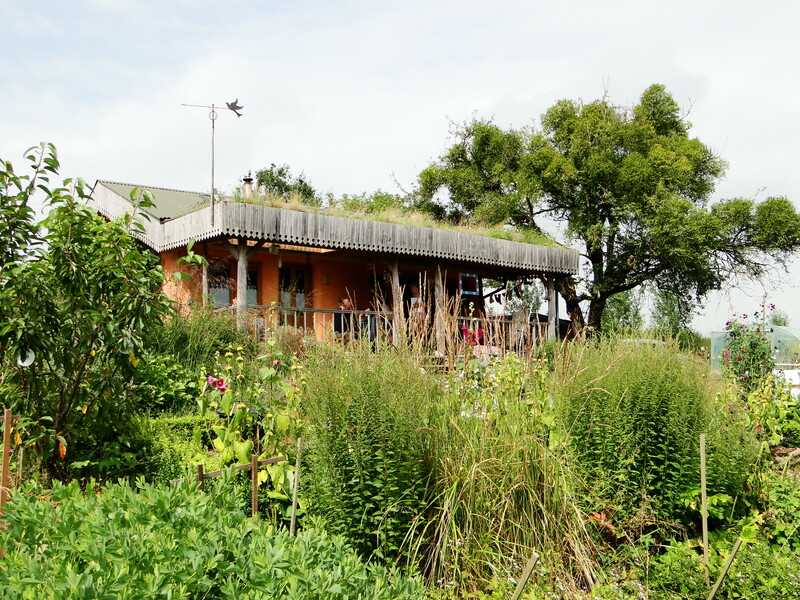 I really loved how the kitchen garden was such an integral part of the business. Slops from the bar are used in beer traps to catch slugs and getting through hundreds of eggs every day provides plenty of egg shells, used as another effective method of slug control. Any waste from the kitchen garden is composted or fed to The Bell’s own pigs. Janet explained that from the very beginning they grew their own cut flowers for the restaurant and other public areas. It also felt that the kitchen garden had connected a building and business to the land around it and also the local community. Within the grounds of The Bell are two large, Monmouth Burgundy, perry pear trees, one of which is believed to one of the oldest in Wales showing the connection between the land and produce goes back a long way in this village. The pears will be picked later in the season and made into perry. There’s also an inspiring bartering system with the local community where fruit such as plums and damsons from other people’s gardens and farms is brought to The Bell and exchanged for vouchers. The surplus fruit is then turned into jams and chutneys by the kitchen for use in the restaurant and for sale to guests. This is a working kitchen garden and a really inspiring place. There are no airs and graces, no feeling that aesthetics are more important than the food they are producing. 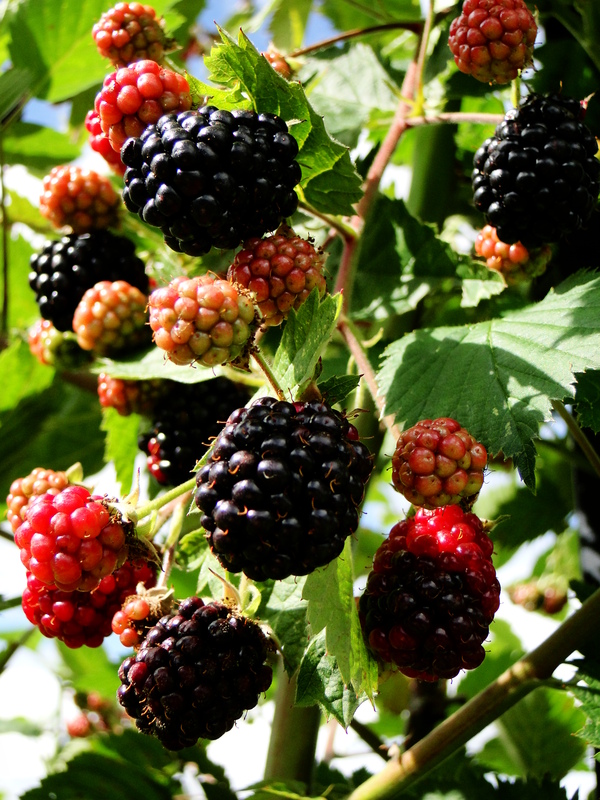 I came away with some ideas that I could quite easily use on my allotment and I especially loved the idea of growing thornless blackberries over a pergola. William and Janet welcome visitors to the kitchen garden with an honesty box at the entrance and any money raised is donated to charity. With local produce playing such an important role at The Bell it is no surprise that they are taking part in the Abergavenny Food Festival this September. 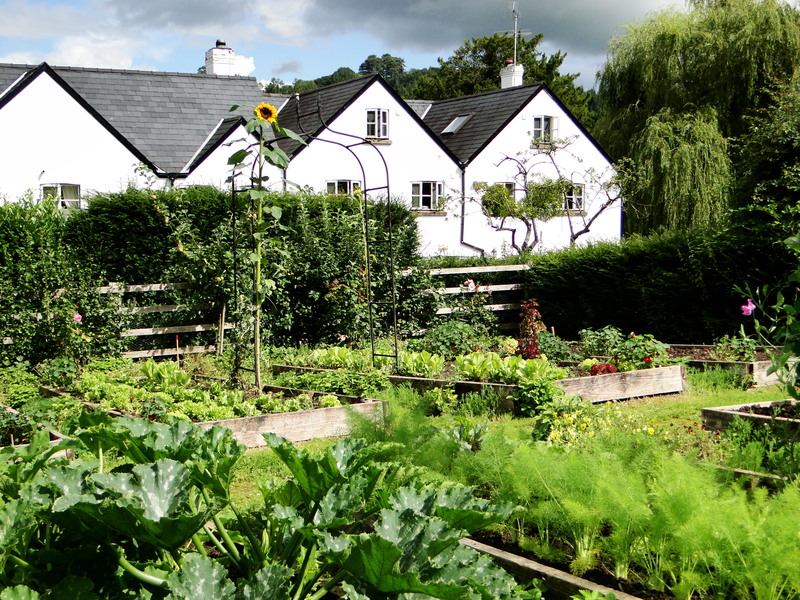 Xanthe Clay, the Daily Telegraph’s food writer, is hosting a special lunch which will include the opportunity to have a wander around the kitchen garden and enjoy some local Welsh wine. 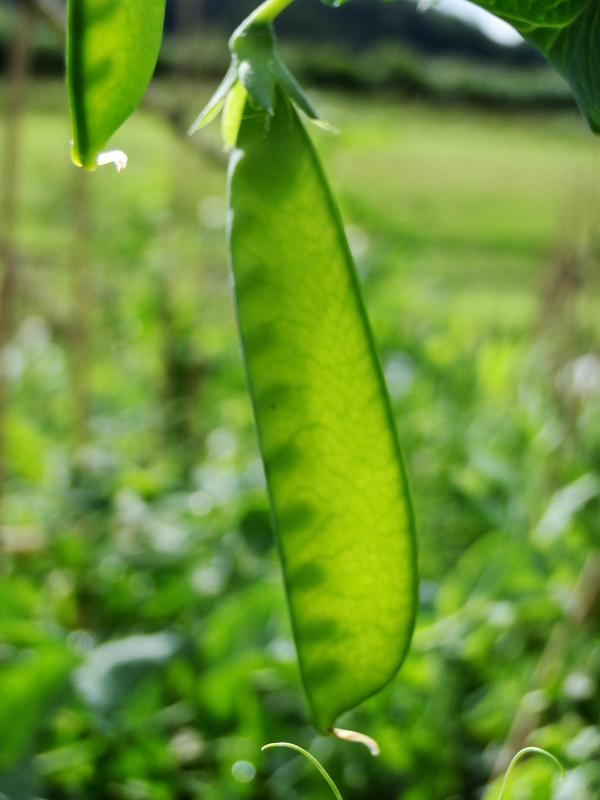 For more information about The Bell and their kitchen garden take a look at their website skenfrith.co.uk. And the competition winner is . . .
≈ Comments Off on And the competition winner is . . . Yesterday was the closing date for the chance to win a day at Kate Humble’s rural skills centre, Humble By Nature. 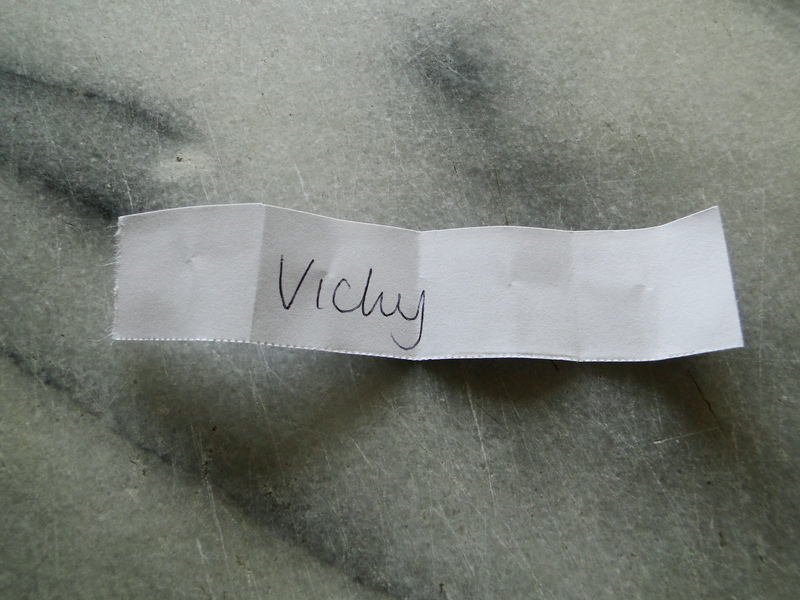 Wellyman drew a name from a hat this morning and the winner is . . . Vicky Dewar. Congratulations Vicky. I’ll be in touch via email to let you know what to do next. Sorry to everyone else who entered but thank you for taking part. I love my tea; I’m quite partial to a slice of cake now and again and I have to admit I do like a nosey around other people’s gardens. Combine them all and I’m like a pig in the proverbial. So, whenever possible, I try to visit an NGS garden where I can indulge in all three and, even better, the money I spend goes to charity. 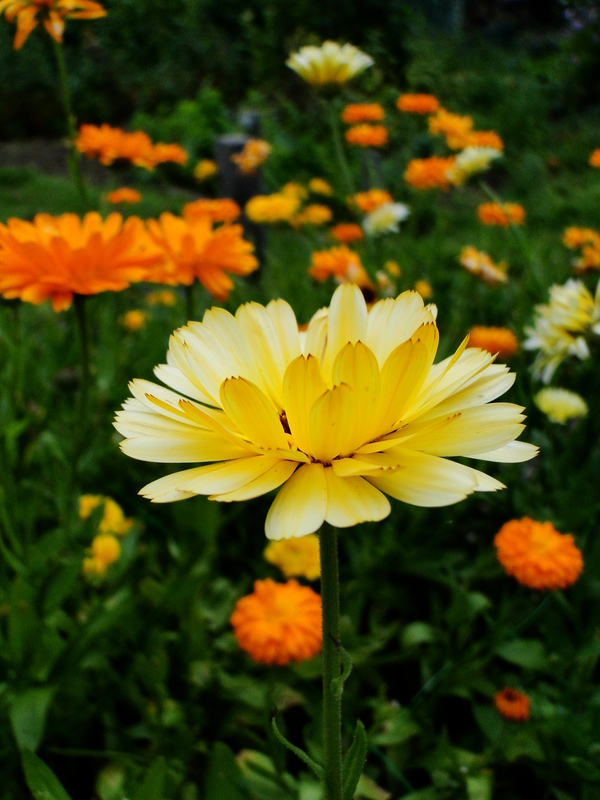 The National Gardens Scheme (NGS) started in 1927 as an idea to raise money for the Queen’s Nursing Institute. Private gardens would open for the charge of a ‘shilling a head’ and the public would get the opportunity to visit gardens that would otherwise be out of bounds. In the first year 609 gardens opened and by 1931 it was proving so popular that Country Life magazine published a guide-book to the gardens that would open. The ‘Yellow Book’ as it became known, after its colourful cover, now contains over 3700 gardens that open, raising over £2.5 million for selected charities every year. 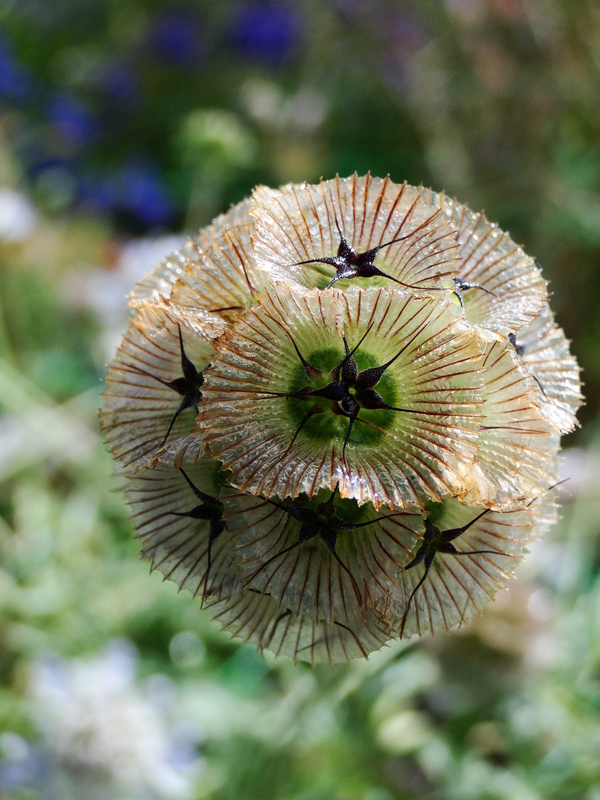 The joy of the NGS is the wide and varied choice of gardens on offer. There are larger gardens which are often already open to the public which donate the admission fee on these days to charity, there are gardens created by renowned garden designers, the personal gardens of these renowned garden designers, creekside cottage gardens in Cornwall, gardens famous for their snowdrops, gardens created by alpine lovers, and gardens high up in the Pennines. We have visited a few gardens locally to us over the years. There was Meadow Cottage in the Forest of Dean which was a third of an acre and packed with beautiful plants. Kentchurch Court on the Herefordshire/Monmouthshire border has been lived in continuously for more than a thousand years by the Scudamore family and is surrounded by 25 acres of beautiful gardens and woodland. Brockhampton Cottage, the garden of Peter Clay, the co- founder of Crocus, was designed by Tom Stuart Smith the multi-gold medal winner from RHS Chelsea. Then, a couple of weekends ago, we made a trip to the garden of Noel Kingsbury in Herefordshire. Noel is a garden writer, designer and lecturer best known for his ideas on naturalistic planting approaches to garden design. He is a lecturer at the University of Sheffield in the Landscape Department which is building quite a reputation for innovative approaches to our urban spaces. Noel has also collaborated with the designer Piet Oudolf on two books. 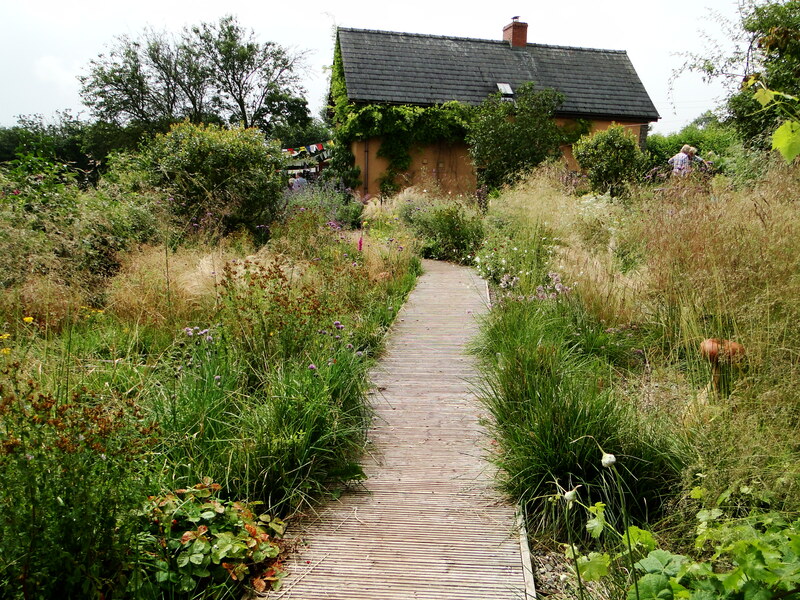 I’m a big fan of Oudolf’s planting ideas and the opportunity to visit a garden which was similar in ethos was too good to miss. So often gardens open to the public are not gardens of an individual and are managed by a team of people, the great thing about the NGS is it gives us the opportunity to experience personal gardens and the idiosyncracies in them. Noel’s garden was packed with spirit and personality. He’s obviously a keen traveller which was evident with the yurt, Balinese flags and statues dotted about the garden. There were pots and tables decorated with broken pots and china and small woven willow decorations placed throughout the herbaceous borders and meadow. The garden had a real sense of place sitting comfortably in the local landscape. 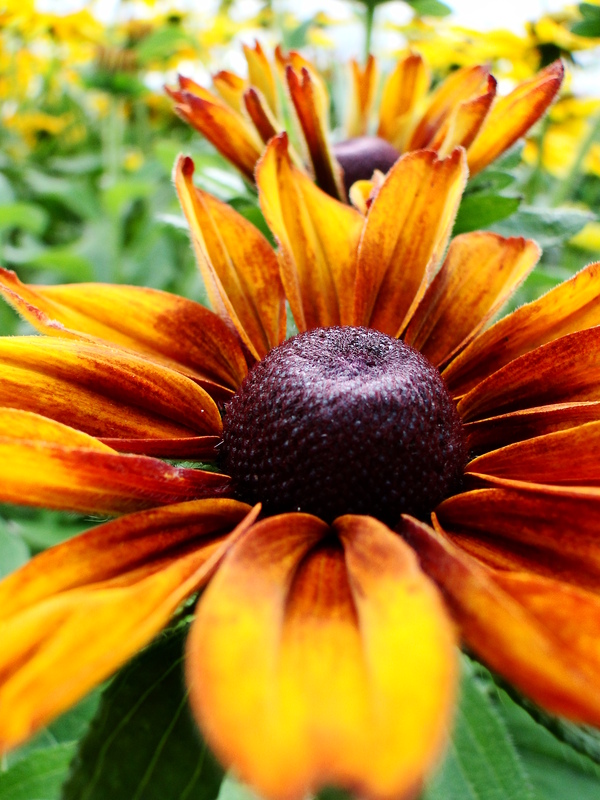 Noel likes to experiment with the blending and blurring of the line between garden and nature. The more cultivated area of the top part of the garden was planted with persicarias, grasses and sanguisorba, amongst others, taking its influence from nature. Paths meandered down to two ponds and then to a meadow area where the garden and surrounding countryside seemed to merge. Teeming with bees and butterflies the garden appeared to be a haven for wildlife. There were bee hives, a small orchard, chickens and a veg growing area and it felt like a garden of someone with a strong connection to the land. I loved his ‘Pavillion’ with its green roof which is used as accommodation for B&B guests but would also make the most amazing place to write. Although, whether you’d actually get much done whilst staring out, onto the garden, is another matter. The slope below the pavillion smelt wonderful with the lavender emitting its essential oils into the muggy air. 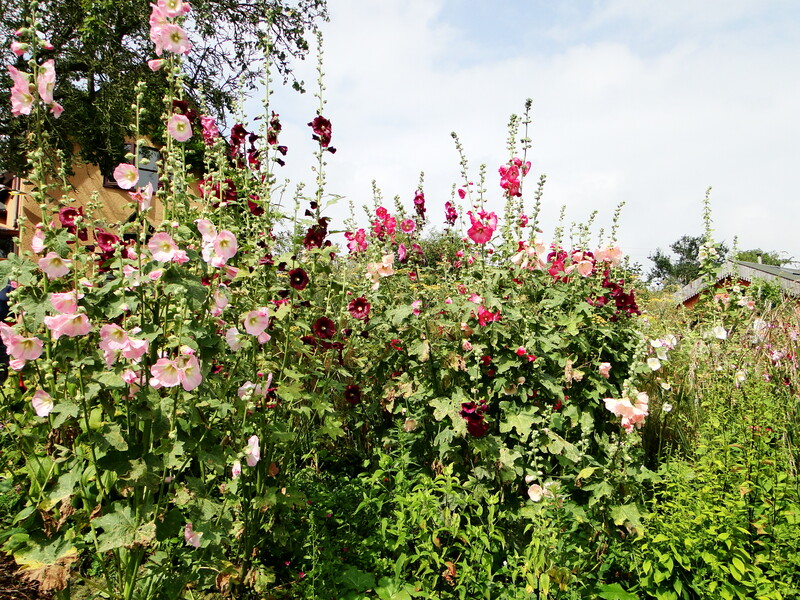 There was a particularly impressive patch of hollyhocks, towering above me, and swaying in the light breeze; they were like a plant version of his Balinese flags. Not exactly in keeping with the naturalistic planting of other parts of the garden, I liked how, although he obviously has strong ideas about design and planting, there are plants which find their way into the garden even if they don’t necessarily fit. 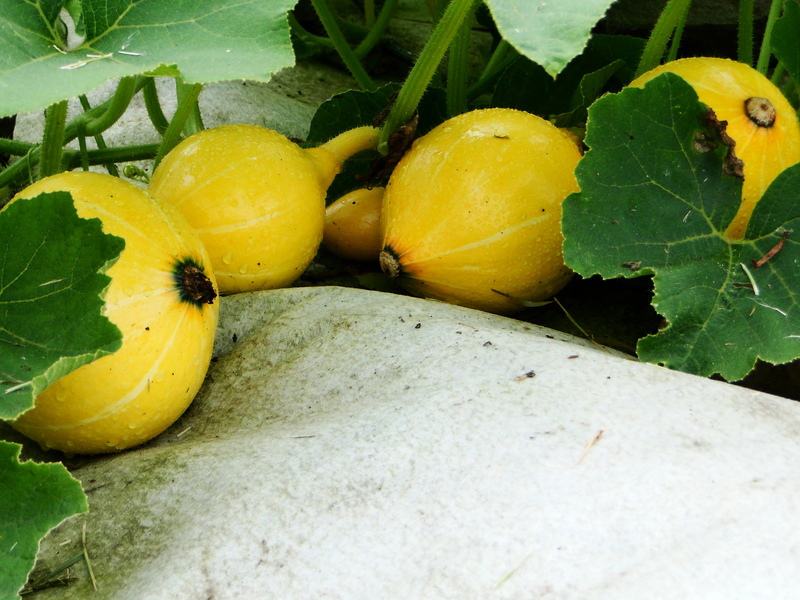 There was squash envy, as I compared my own pathetic plants and my two measly squashes to his abundance of them. I love naturalistic planting but for me elements of Noel’s garden were a little too loose. I personally would like a bit more structure from trees and shrubs. However, that is the joy of visiting other people’s gardens it gives us the chance to see how others use and see the space they have in front of them. It might be the end of August but there are still plenty of opportunities over the next couple of months to visit some fascinating gardens and of course eat lots of cake. This Sunday, for instance, blogger Victoria’s Backyard opens up her garden in London, on September 2nd Peter Clay, co-founder of Crocus will invite visitors to Brockhampton Cottage and on the same day it’s possible to visit the Pretoria Road allotments in Bristol. The NGS have a great website so it’s really easy to find a garden to visit. I’d love to hear about any NGS favourites of your own. It was all going so well. My plan this year was to get from mid April to October without having to buy any lettuce. 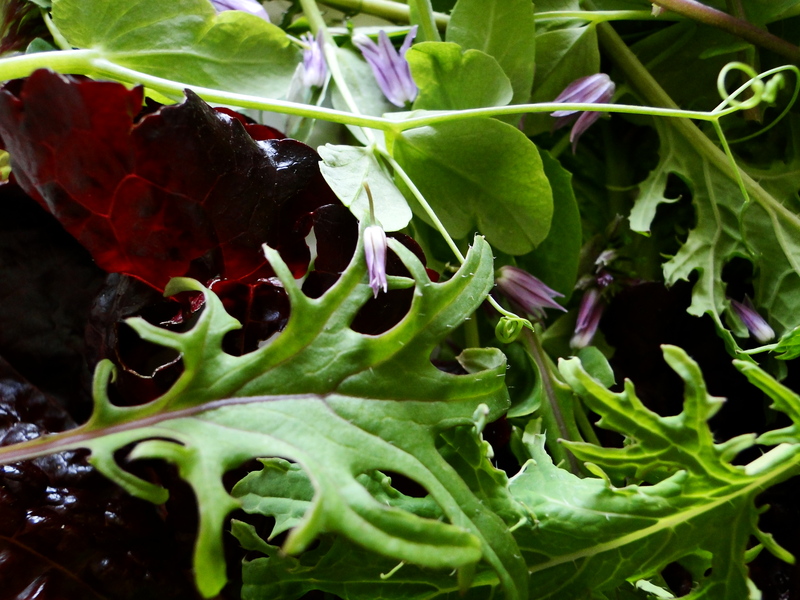 After an inspirational day with Charles Dowding, the salad growing guru, I even harboured ideas of winter lettuce. Gone would be the bag of soggy salad leaves with all the verve and vigour of a teenager in the morning. 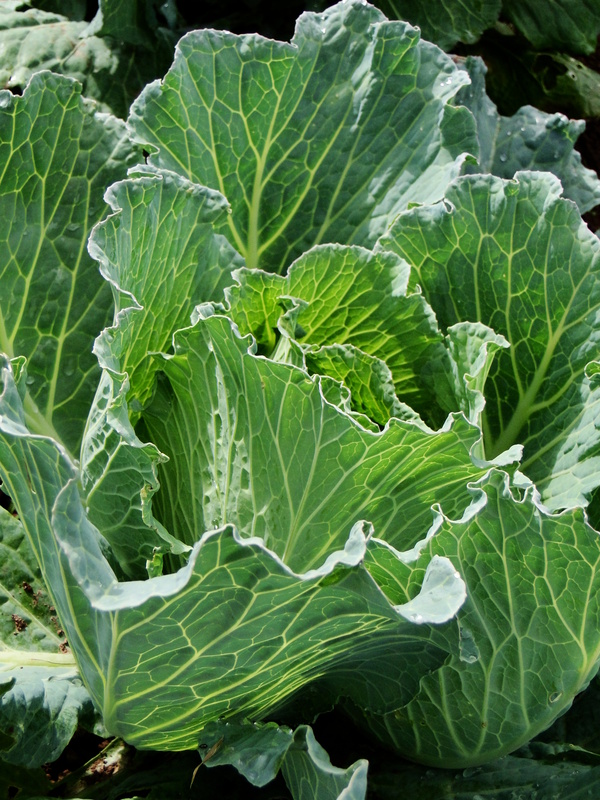 We would be self-sufficient in lettuce and leaves; that shouldn’t be too hard. In the past it’s been my organisation, or lack of it, that has let me down. Starting off well, I then forget to keep up with the sowing regime for the holy grail of successional crops and, inevitably there ends up being a gap. This year would be different and it really would have been, if it hadn’t been for the slugs and snails. 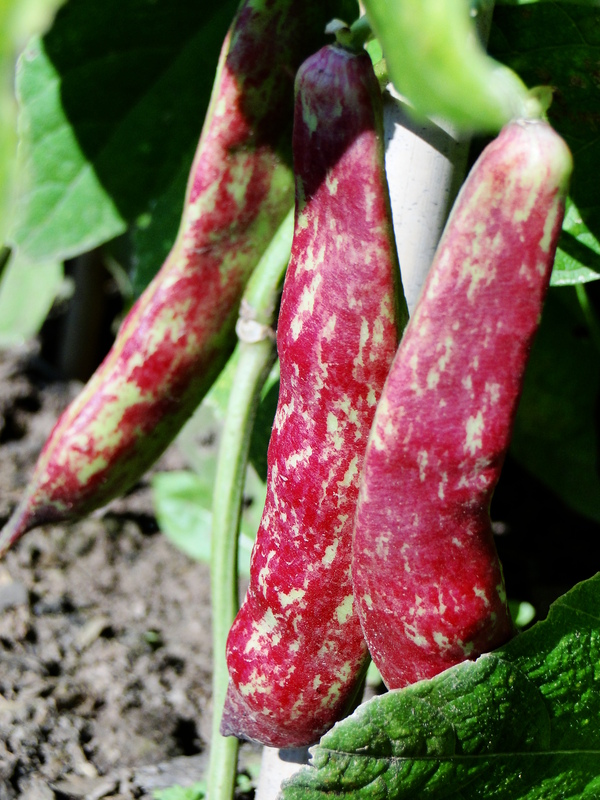 It started well with harvests of ‘Freckles’, ‘Rubens’, ‘Dazzler and ‘Little Gem’ all from the plot. I was priding myself on how organised I was being by sowing some trays of salad leaves before we went on holiday, in June, so that these would follow on from those at the allotment. I prefer to grow salad leaves in containers at home. I did try them in the ground last year but they were quickly infiltrated by weeds and at one point it was hard to distinguish what was weed and what was edible leaf. Well they say pride comes before a fall and, whilst my organisation skills may have improved, my ability to protect my salad leaves from slug attack hasn’t. Three troughs and a large pot have all been annihilated. One container was 6ft off the ground, for heaven’s sake. All I can say is slugs must have an incredible sense of smell. They even bypassed hostas to climb the equivalent of a mountain to them, to dine out on my specialist Italian salad leaf mix. The tiny seedlings which had appeared just before we went on holiday had gone by our return. I’ve resown twice and moved the containers but each time, just as I see little green shoots emerging, they disappear just as quickly. Strangely lettuce on the plot hasn’t been touched, thanks I can only think to the resident song thrushes and blackbirds but in recent weeks with warmer weather my plot salads have bolted and now reside on the compost heap. And so, with a sense of guilt and disappointment a bag of salad leaves and some cos lettuce made its way into the shopping trolley at the weekend. 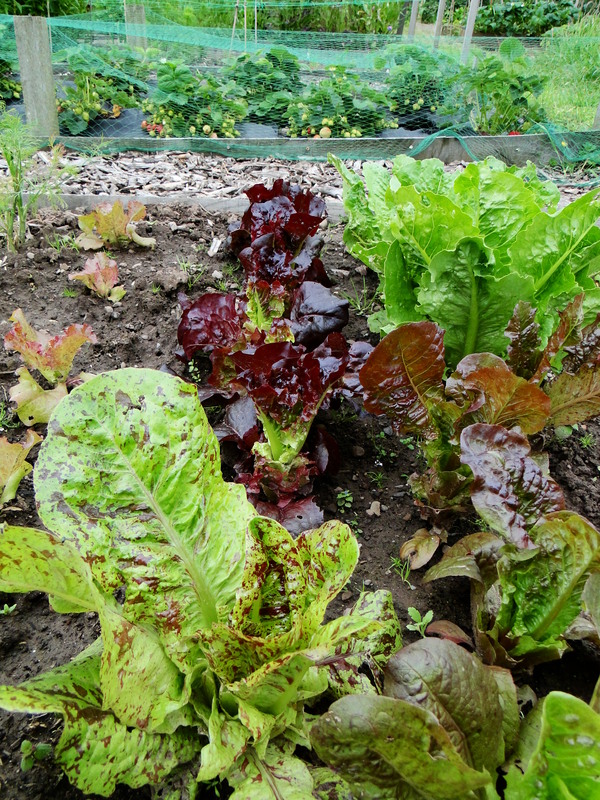 I never expected to be self-sufficient when I took on the plot but I think because lettuce is so easy to grow that I should at least be able to achieve it with them. We had some non-gardening friends stay with us back in June and when we were preparing food they kept asking what was from the plot and it felt a little embarrassing that so little of it was from there. Similarly, looking in the trolley at the weekend I did think we should be buying less vegetables in August. Surely the plot should be providing more. I’ve accepted that without a greenhouse and living in the damp west of Britain with perfect blight conditions that tomatoes are a lost cause. Carrots are impossible on the carrot-fly ridden allotment and although I’ve had tasty baby carrots grown in containers at home these were never going to mean I could stop buying carrots over the summer. The courgettes have been slow to get going and I’m by no means inundated. I’m actually missing my courgette glut. Peppers, and aubergines both need the extra warmth of a greenhouse. I had about a month supply of new potatoes but don’t want to devote more space to spuds. My plot growing is still in its infancy, as this is only my second season, so some of it is learning what is most productive and easy to grow but it’s also accepting that the veg growing portrayed by the glossy gardening magazines isn’t always the reality that the majority of us experience. Just as with other aspects of the media constantly showing us images of what constitutes perfection, the immaculate house, the flawless body, the most desirable products there is a danger of ‘growing your own’ becoming another element of our lives where we feel we have to live up to ideas of perfection. There is an immense feeling of satisfaction when I can cook a meal from the plot but to do this is difficult to achieve over a sustained period. Perhaps the disparity between the portrayal of fruit and veg growing in the media and the actuality of it is one of the reasons why many new allotment holders hand back their plots after a few years. The idea of the River Cottage type utopia is very enticing but the reality is somewhat different. I have salad seedlings on the go and I’m keeping a close eye out for further slug attacks but whilst I wait for them to achieve an edible size I guess I shouldn’t feel guilty that my plans didn’t quite come to fruition. Much as I would have loved to have been wandering the cobbled streets of some Mediterranean town or sipping a cocktail somewhere glamorous, staring out to sea, there are some weekends when a girl has to put such plans on hold and get down to tackling those jobs she’s been putting off for weeks, if not months. The sort of jobs that get neglected in the hustle and bustle of busy lives or are pretty unappealing when the sun is shining, namely compost making, shed tidying and a trip to the tip. It’s a hectic time of year, as Wellyman is studying for a degree, in his spare time, with the Open University. He’s coming towards the end of his third year, with essays and a project due in over the next couple of weeks, so whilst he was busy scribbling away it seemed the perfect time to get on top of the jobs that I haven’t been able to do because of all the rain. 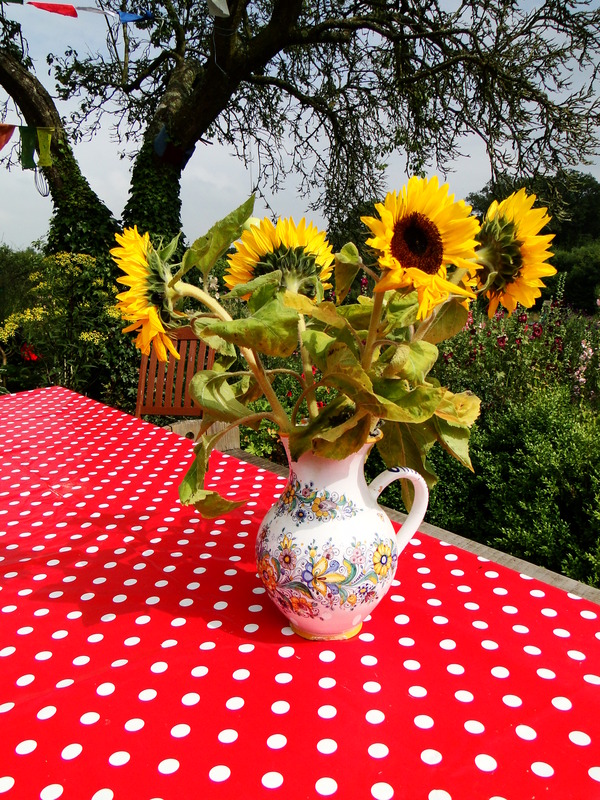 After a rain sodden morning on Saturday I was pretty grumpy having had to listen to stories of the glorious sunshine and heat that were elsewhere but by 2 o’ clock the sun was finally shining and the plot beckoned. 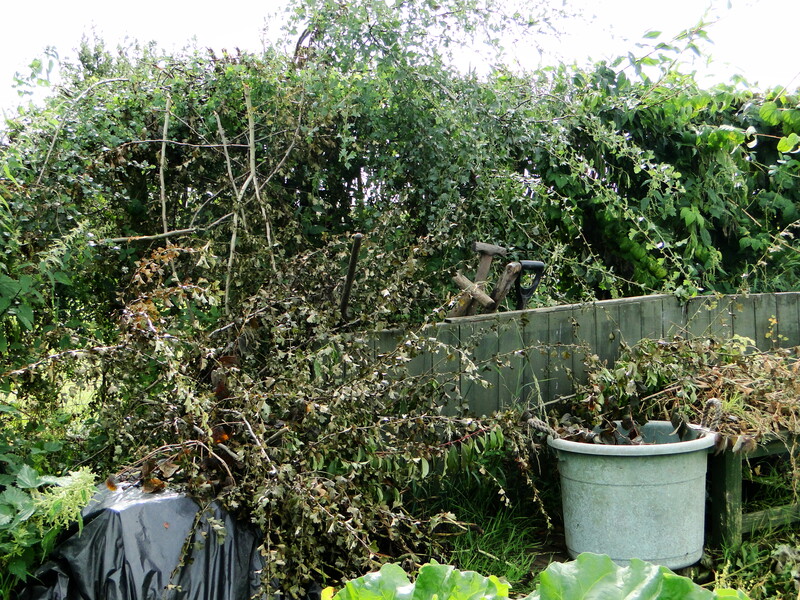 Loppers at the ready, I tidied up the mess left behind by the hedge butchering incident of the previous weekend. 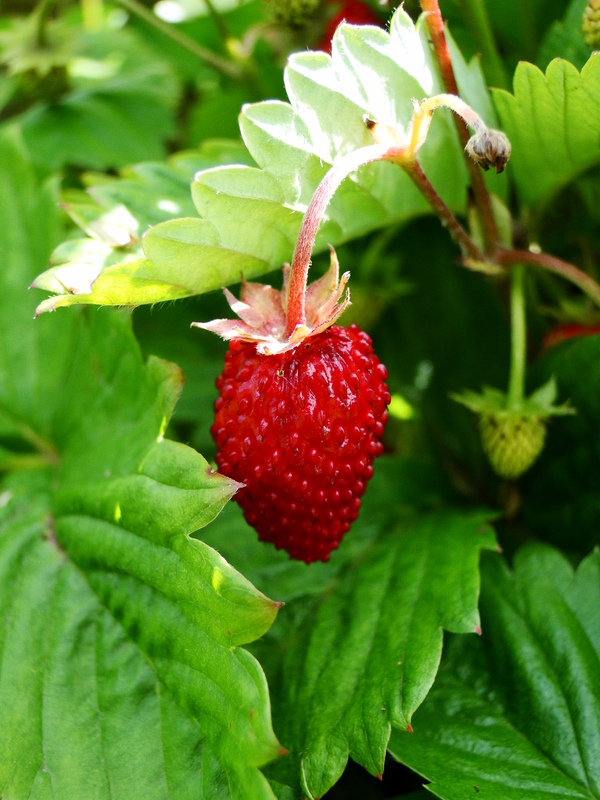 I wrestled with a few wayward bramble shoots and then turned my attention to the tayberry. I had thought it would be a real nightmare to remove this year’s fruiting canes and tie in the new growth, some of which was 10ft long and growing along the ground into my other beds. Fortunately, it didn’t prove to be as bad as I had expected. I had thought I would have to be swathed in protective clothing in case one of the thorny canes sprung back at me but I even managed to tackle it without gloves, which I’d forgotten to bring up with me. Gingerly, and somewhat painfully, I twisted the long, arching, and still very pliable canes into the support that was already there, tying them in place with some twine. Remarkably, I came away with only a few puncture wounds and scratches! Celeriac remoulade in a couple of weeks, I think. The next on the list was the compost. I’ve done very little to the compost heap this year. Visits to the plot have often been snatched in between spells of rain so that piles of plant debris have tended to be dumped on top of the heap without any work to make them more compostable. This untouched mountain of material had got so large that, rather than tackling it, I simply opened up another front of composting waste, depositing the old broad beans and peas on a pile next to the actual heap. It was starting to look a little bit of a mess and, if I actually wanted some compost from it, I really needed to give it some attention. The loppers were a surprising good tool to chop up large pieces of plant material; I cut back my comfrey plants and added the leaves to the heap with some nettles that were growing around my tool storage area. I had a bit of rummage underneath and despite my neglect there was the lovely sight of some dark brown crumbly compost below the layers of the more recent additions. The heap is contained simply in one of the large sacks you get sand delivered in from a builders merchant, with 4 stakes at each corner and a couple of covers to put on top to stop it getting too wet. Of all the different types of compost receptacles I’ve used I have to say it is the simplest and the most effective. Although, I can’t claim any credit for the construction, as it was already on the plot when we took it over. It does show though, that all those different products marketed at us as the best way to make compost are probably unnecessary if you have the right spot for a rubble sack and some stakes. 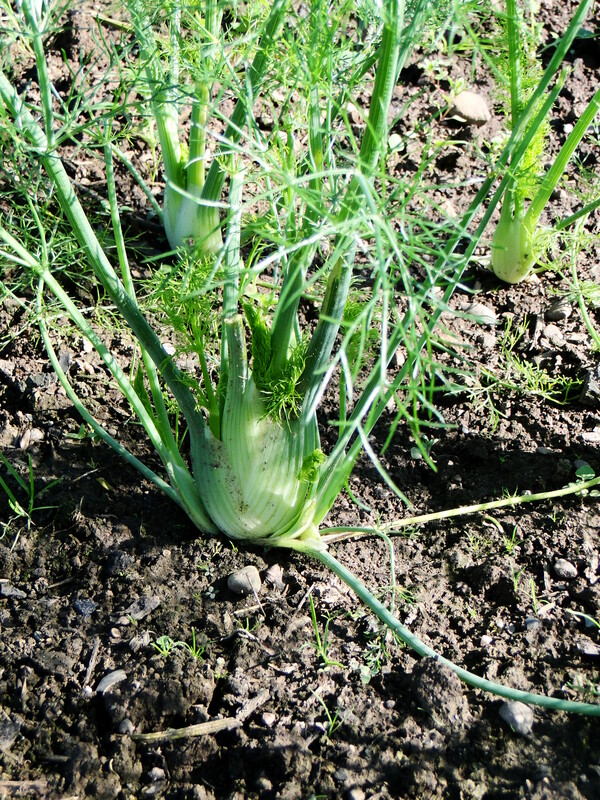 I’m so chuffed with my Florence fennel which has been my nemesis in recent years. Sunday morning was shed time. I had a clear out several months ago and had failed, again, to keep any sense of order or tidiness but one of the problems was that I had never actually got round to taking everything that had been bagged up to the tip. A third of the shed, and that’s a significant amount of floor space in my tiny little storage area was taken up by rubbish bags. Once these had been removed the shed wasn’t actually as bad as I had thought. The final job was to add another line of wire support for my espalier apple. When we bought it in the spring it was two-tiered but when I was pruning it a few weeks ago I had spotted two branches that looked perfect to be trained out horizontally, to create a third tier. We’d picked up some hooks with a bolt on them from the hardware shop and Wellyman did the drilling. It’ll be a while before it has filled the space but already the apple tree has created a lovely screen between two parts of the garden. Now my ‘to do’ list is looking a lot a shorter maybe I can find the time for a few cocktails, might have to be in the back garden though. I’ve been feeling a bit glum the last few days with one thing and another and the weather is miserable, AGAIN. It was like November on the plot yesterday, the wind whipping the fleece cover off my brassicas and the sunflowers and dahlias needed some remedial staking to prevent stems from snapping. After a night of torrential rain, in fact, at one point it didn’t sound like rain, more like someone had turned on an enormous tap, I’m now greeted with a sky the colour of battleship grey. I thought Farrow and Ball, the paint company famous for the names it gives to its paints, such as ‘cat’s paw’, ‘smoked trout’ and ‘elephant’s breath’ might have a more romantic and enticing way of describing the colour I can see out of my study window. They can’t come up with anything better than ‘down pipe’. Says it all really. So, what could I write about that was bright and cheery to bring me out of this descending gloom. After last week’s beekeeping course at Humble By Nature I’m looking out for bees wherever I go. 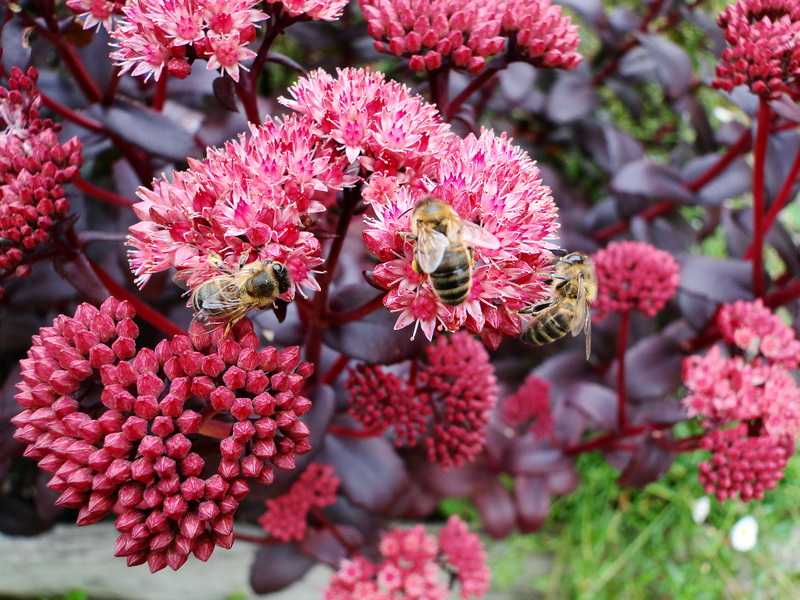 There was a brief dry spell yesterday afternoon and whilst having a bit of a potter I noticed my Sedum ‘Purple Emperor’ plants were covered in bees. Off I went to get the camera and an absorbing half an hour passed as I snapped away. Sometimes it’s great to look at the bigger picture, to be in a vast open landscape which always makes me feel incredibly free and invigorated but, equally, I love getting down to a really small level, getting up close to insects and plants and seeing the incredible detail there is, even on such a minute scale. There is a whole world going on around us that so often passes us by. Initially, it was the honey bees that had caught my attention but once I was kneeling on the path I could see it wasn’t just Apis mellifera that was tucking into the pollen and nectar. 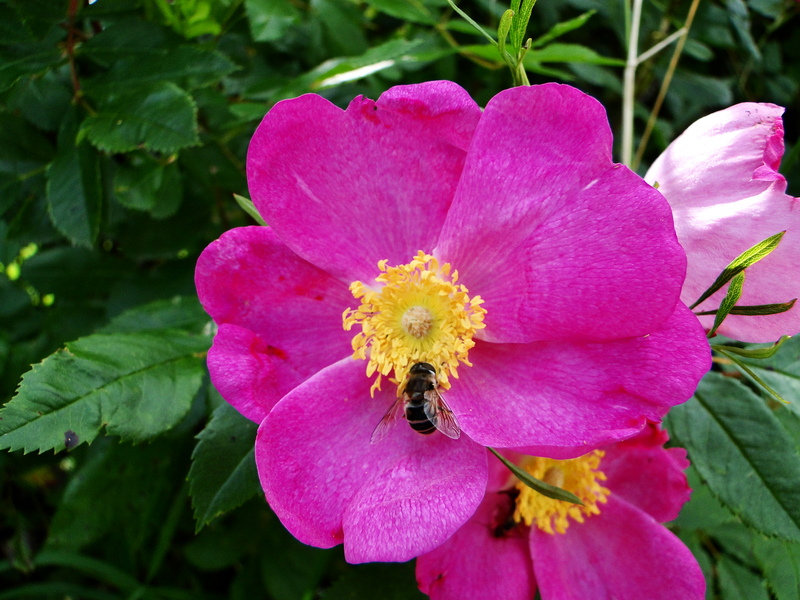 There were bumble bees, hoverflies and other little insects I have been unable to identify. My entomological skills are frustratingly lacking. 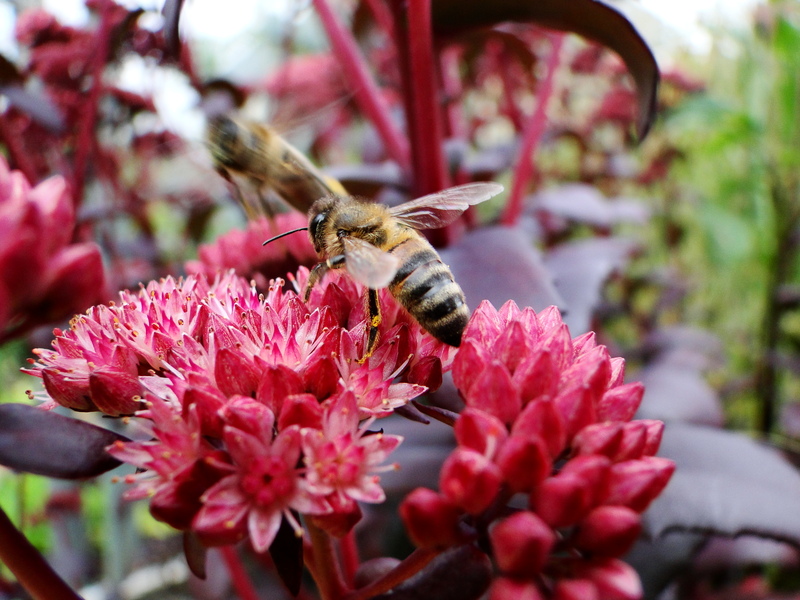 Sedums are great plants not only looking good but being incredible sources of pollen and nectar. Some of the first plants I grew, as a child, were sedums and I could quite happily spend hours watching butterflies feeding on them. I think ‘Purple Emperor’ is particularly attractive with its plum coloured, fleshy foliage appearing in spring and then the pink little star-like flowers opening from August. It is much less bulky than other sedums and I love the contrast of the dark foliage with other late flowering plants such as rudbeckias, heleniums and verbena rigida, all excellent sources of pollen and nectar, too. 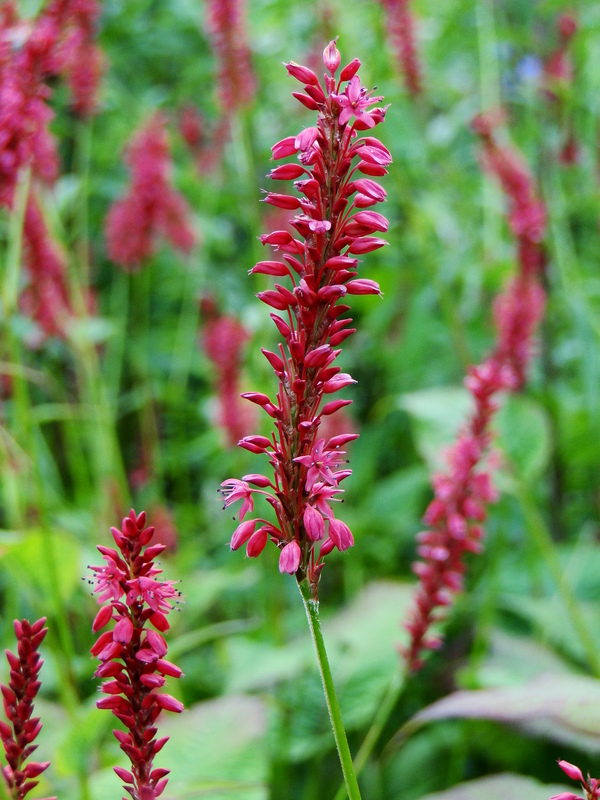 In fact these later flowering plants are vital for insects and, particularly honey bees. At this time of year many of our native wildflowers have gone over and honey bees really struggle on their foraging flights to find food. Studies by Sussex University have shown bees have to travel much greater distances in August and September in search of pollen and nectar. 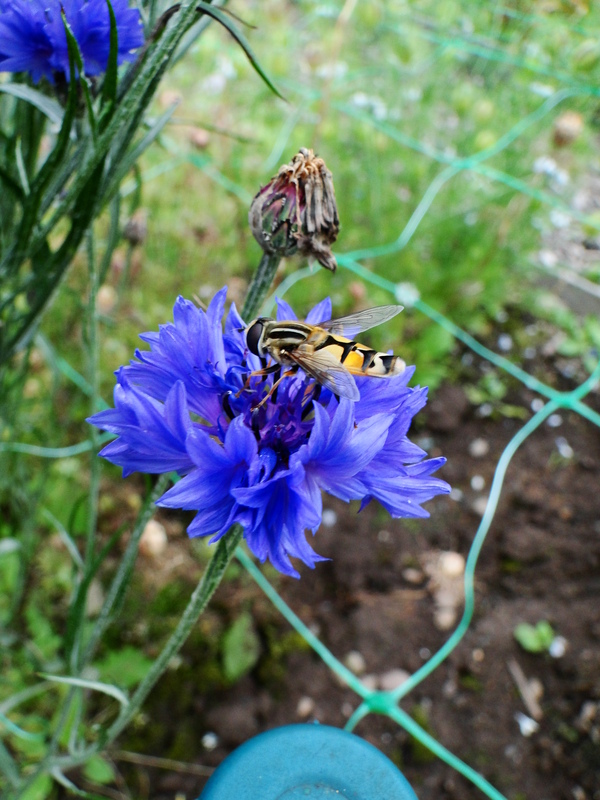 At this time of year, perhaps more than any, honey bees have come to rely on garden flowers to provide them with food. 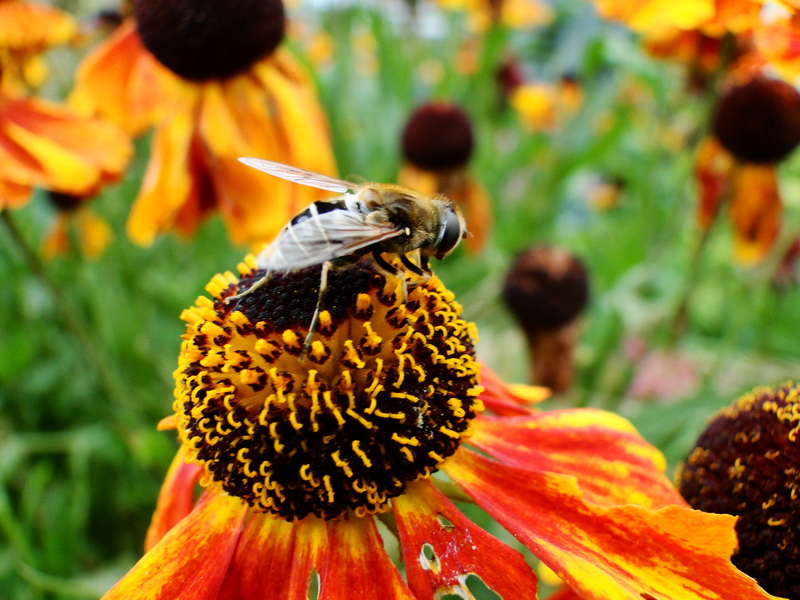 Urban bees in fact, are much better off than their rural counterparts because of the greater concentration of gardens and flowering plants available to them. Sedums are easy to grow; I also grow Sedum spectabile and both have coped with dry spells and this year’s deluge. They are also so easy to propagate from stem cuttings and even from a leaf. Simply remove a leaf from the stem and push it into a pot filled with some compost mixed with quite a bit of grit, water and put on a window sill. It won’t be long before a little shoot will appear from the base of the leaf. Let this grow until you can see roots appearing from the bottom of the pot and then pot on. Crocosmia, achillea and verbena bonariensis are all proving popular feeding stations in the garden and on the plot this dahlia is attracting a lot of attention. It’s rubbish as a cut flower, dropping its petals within minutes of picking but it has earned its place by obviously being packed full of bee food. 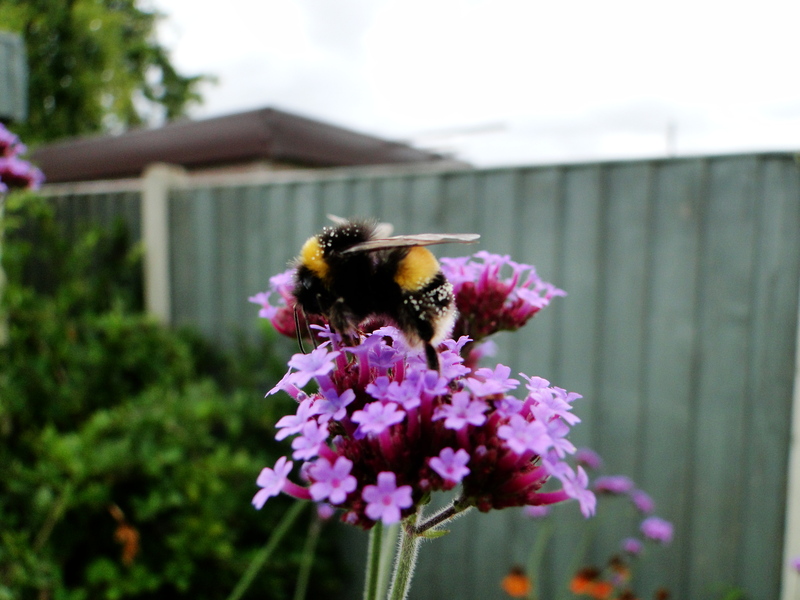 The scabious have been a success for me and the passing bees. They last well in a vase, are very prolific and bees love them. Our bees are struggling so much but as gardeners we can do something to help by planting as many of these bee-friendly plants as possible. 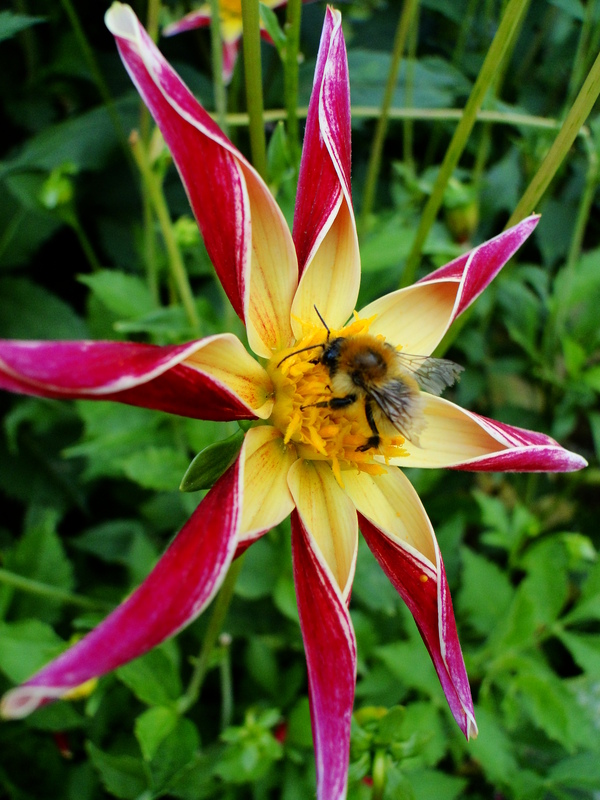 For fascinating and informative posts about bees and other topics, take a look at Bee Strawbridge’s excellent blog. Sometimes something happens that makes me stop and wonder about some of my fellow humans. Maybe it’s an act of vandalism, the seemingly pointless destruction or defacing of an object, people who drop litter or those couples who park up in a lay-by and sit at the back of the car on fold-out seats eating their lunch as cars whizz past when they have just driven past a stunning beach, gorgeous lake or beautiful wood. I just don’t understand some people some times. Well I had one of these moments the other day. On my way to the plot is a gate, once through this I turn right and walk along a small stretch of roadside verge before I get to the allotment site. Running along the verge is a hedge; the boundary to someone’s garden. It’s nothing special to look at, I guess, I’m sure most people walk and drive past it without a glance. 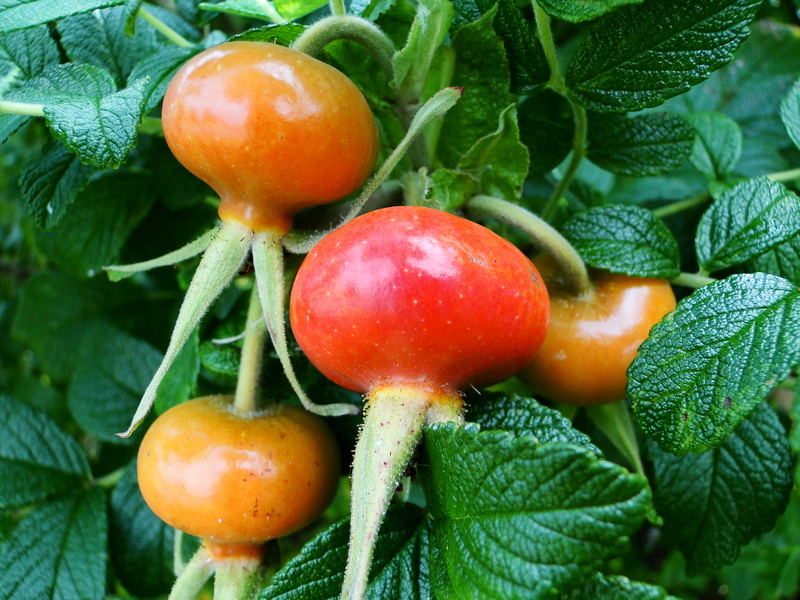 Made up mainly of Rosa rugosa; only the other day I was admiring the beautiful pink flowers and the first big fat hips as they started to ripen. At the far end of the hedge was a big bushy shrub with large pink, feather duster-like blooms. I don’t know what it was. It wasn’t the sort of plant you’d necessarily want in your garden, lacking quite a bit of refinement but, here by the side of the road, it was providing a splash of colour and more importantly it, and the rose, were providing an important source of pollen and nectar for our struggling insects. You may have noted my use of the past tense. Sadly, when I went up to the plot the other day I came across the sight of a hedge that looked like it had been butchered. Gone were the roses, the hips and the pink flowers, all hacked at by someone who either had no idea what they had done or just didn’t care. The hedge is a good 5ft from the road and it posed no problem to traffic. I did, initially, wonder whether it was the council, who like many other local authorities don’t have a great policy on letting plants grow. There was the story, for instance, of the council in Hampshire that cut down, before it had the chance to shed its seeds, the rare narrow-leaved helleborine orchid, not just once but 3 years in a row. 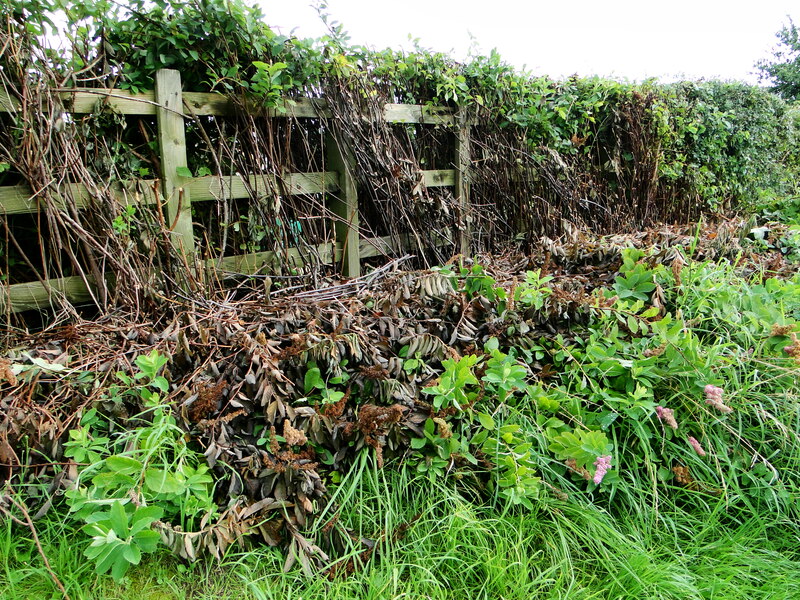 However, when I got to my own plot I realised it wasn’t the council but the owner of the property the hedge bounds. The end of my plot shares a hedge with the property, too and it had been hacked at as well. The mess that was left was frustrating, branches strewn everywhere, some were still attached, but only barely, to the hedge. Hawthorn, forsythia and ribes all made for a really colourful boundary in spring and gave a certain degree of privacy to the plot from another of those infernal trampolines and wayward rugby balls. I’ve now got to spend a half day up there clearing up the mess, cutting everything up to fit in the council waste bags and tidying up the hedge so it doesn’t look quite so dreadful to look at. I’m busy enough without having to tidy up someone else’s mess. But it’s less about this, frustrating as it is, and more about the thoughtlessness about chopping down plants that were important for wildlife. I’m not suggesting that plants don’t need some control occasionally but cutting it back in late winter would have been much better. I am the only one who dreams of a utopia where everyone appreciates the natural world more and sees themselves as a custodian and not the master. I came across a couple of neighbours the other day scattering ant powder about their driveway. I suggested they just boil a kettle instead rather than use a chemical. They looked pretty sceptical so I saw no point in suggesting they leave the ants alone as they posed no problem. Anyway, apologies for the rant. It looks like it might have stopped raining, so I guess I’d better get off to the plot with my loppers for a spot of hedge tidying. Friday morning was one of those rare days this year, cloudless skies and warm sunshine, the perfect weather to spend the day celebrating the British countryside at Kate Humble’s rural skills centre, Humble By Nature, in Monmouthshire. Several months ago Kate kindly asked me if I would like to come along on one of the courses on offer at their farm. I had always been interested in bees so the opportunity to join the ‘Sustainable Beekeeping’ course was just too good to miss. The courses are held in a large barn where there’s a space for teaching and a kitchen/dining area. After tea, some delicious honey biscuits and the chance to meet others on the course we moved into the classroom. 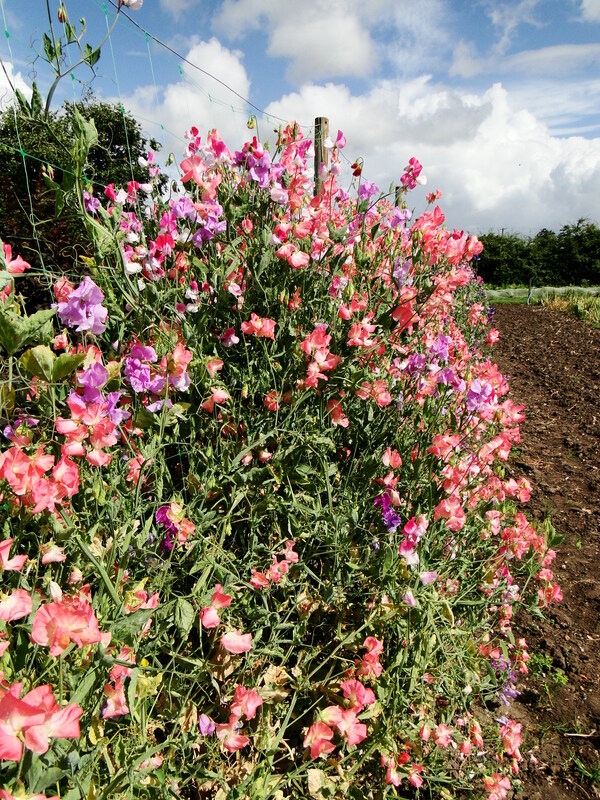 There were beautiful handmade tables and vases of sweet peas dotted about and the barn doors were open giving us views out across the farm. Kate explained a little about what brought her and her husband, Ludo to the farm. Angry about council-owned farms being sold off and split up to generate revenue they decided to buy just such a farm in Monmouthshire with the idea of creating a rural skills centre. They both wanted people to have the opportunity to spend some time on a working farm, learn a bit about a rural skill and enjoy some gorgeous food. They really want the centre to be rooted in the area and have pulled together a team of local experts, farmers and producers to host the courses. Kate then introduced us to Monica and Nicola from Bees for Development who would be our teachers for the day. 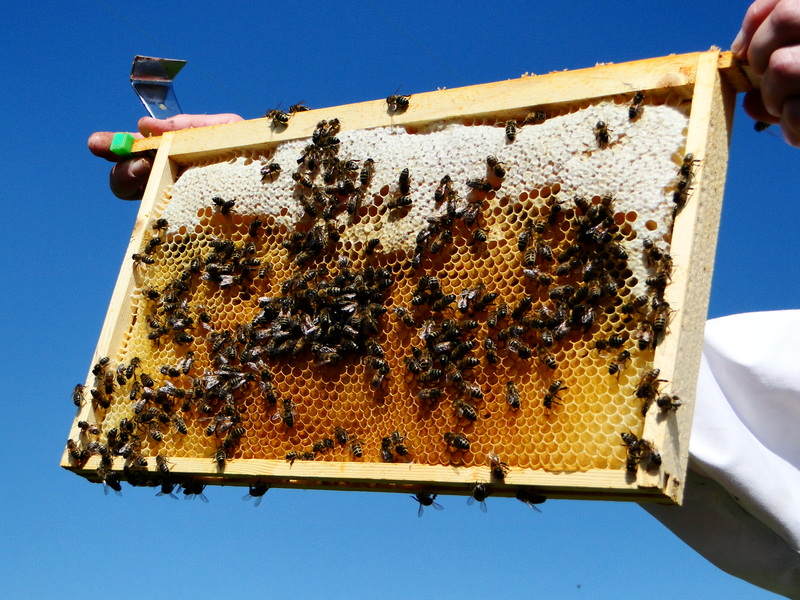 Bees for Development’s main work is in the developing world promoting beekeeping as a way to reduce poverty. 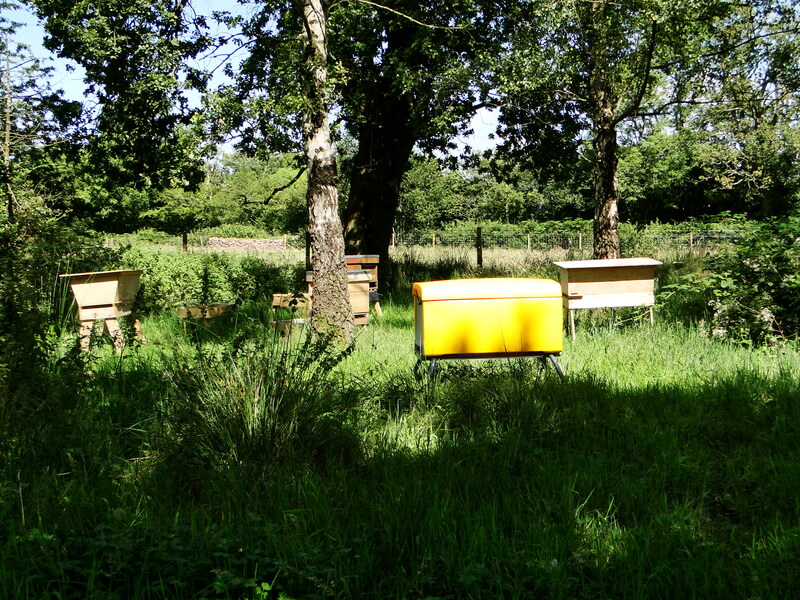 They also provide training, advice and resources to beekeepers in the UK. After an hour or so in the classroom learning a bit about bees and some of the terms we’d be hearing over the course of the day we got to the hands on bit. Donning our bee suits we were given a quick briefing about getting stung, although we were reassured it would be unlikely, and with the smoker at the ready we went off to inspect our first hives brought to the farm by a local beekeeper. 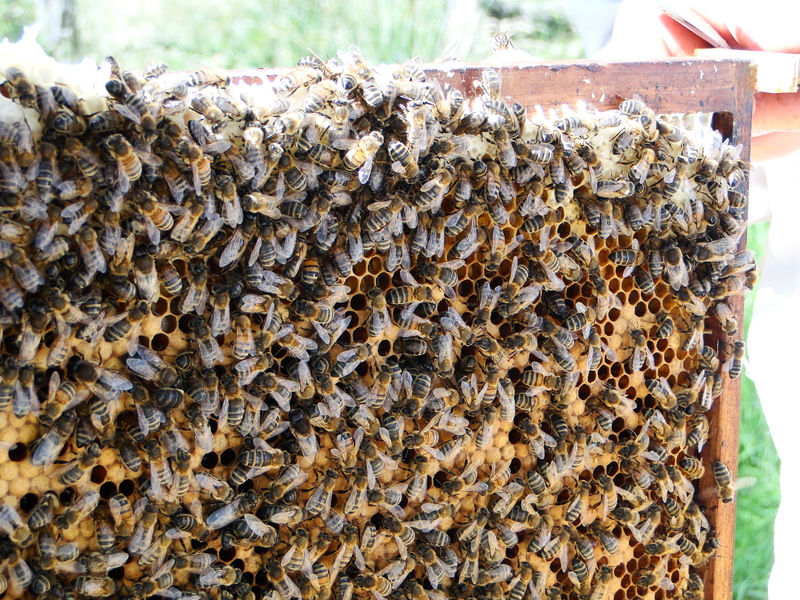 By lunchtime any initial wariness around the bees had evaporated and we had learnt how to identify a queen bee, drones, workers, a brood and so much more. It was so fascinating. I had never seen inside a hive before or even got this close to so many bees and they were mesmerising. Lunch was provided by Kather’s Kitchen. Katherine runs cookery days at Humble by Nature and provides sustenance for the other courses. 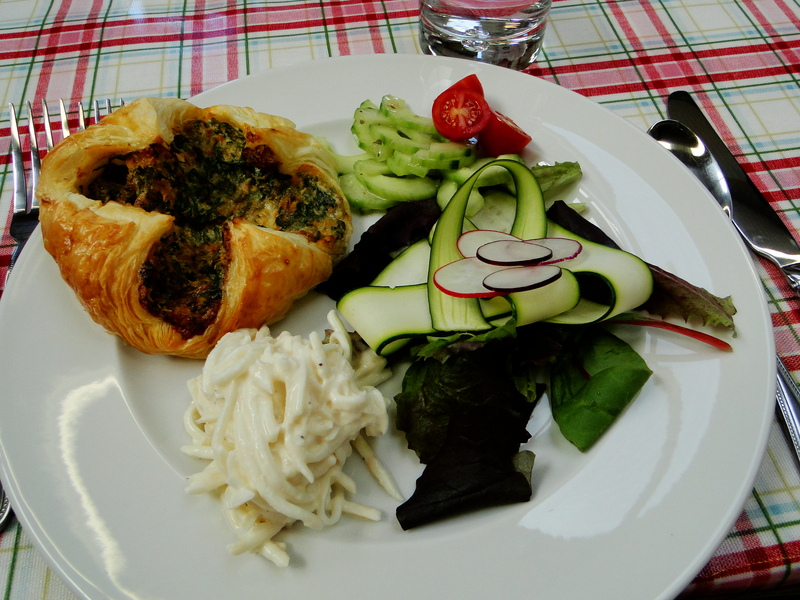 It was all delicious with a ricotta and spinach filo tart, celeriac remoulade and salad followed by panna cotta served with local Wye Valley honey. Suitably sated we returned to the bee suits and visited Kate and Ludo’s own hives, set up in an idyllic patch of woodland. With several different types of hives from a plastic Beehaus made by Omlet, the company behind the Eglu, to the more traditional, and I have to say much more attractive traditional ‘national’ and ‘topbar’ hives, Nicola and Monica were able to show us the advantages and disadvantages of the respective constructions. It was sad to see the hives so lacking in honey, with one of the wettest springs and summers on record, bees have struggled and beekeepers across the country are having to give their colonies supplementary feed to make up for a lack of nectar and pollen. Back in the classroom and refuelled with tea and cake we were taken through the various types of hives in a little more detail, shown how bees are so vital to food production and how there is so much we can all do to protect bee populations, even if beekeeping is not an option. 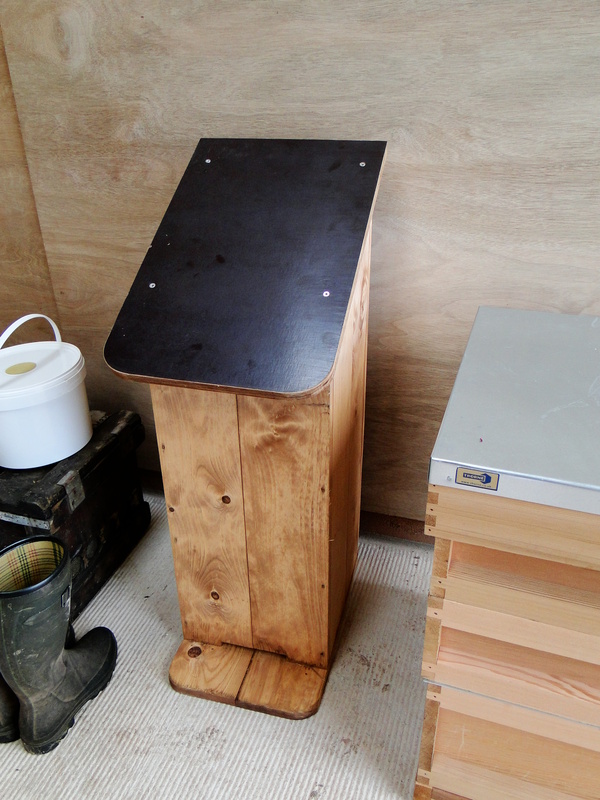 It’s possible to buy from Bees for Development a bee nest box that once in position requires no maintenance; this does mean no honey harvesting but for those short on time it is a way of providing a much-needed nest site which are increasing difficult for bees to find. To end the day we had a honey-tasting quiz, with 6 pots of different honeys we had to decide which matched a series of descriptions we had been given, using sight, smell and taste. The variation in colour and taste between different honeys always surprises me. I particularly like heather honey and as it always reminds me of the moorland of the Pennines. I have to admit I did terribly in the quiz getting only one right but I did get the chance to taste honey from Zambia and Grenada. Monica and Nicola did a great job in packing in so much information into such a short space of time and I think we all came away feeling a bit more knowledgable about bees. 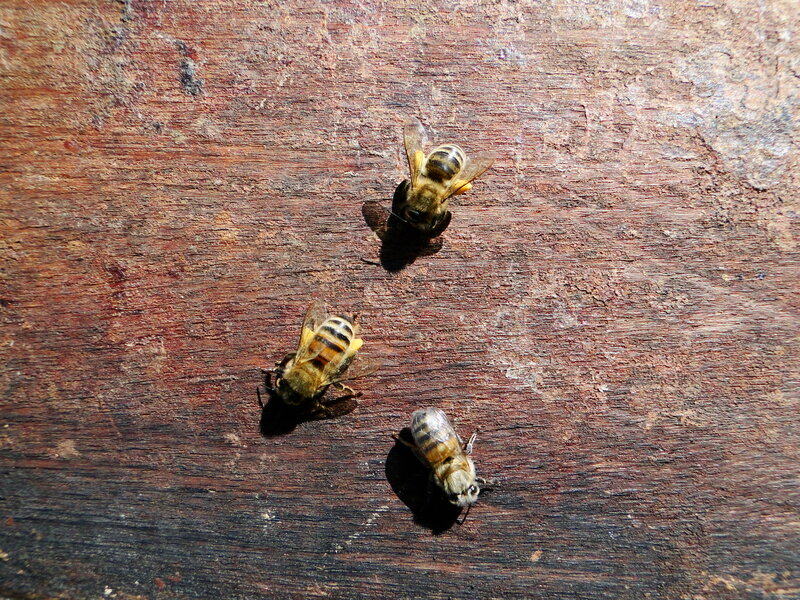 Worker bees with pollen sacs full – you can see collections of yellow pollen on their hind legs. This was only my second time on a working farm; the last time was 30 years ago on a school trip. I do think it’s strange that in a country which has always been intrinsically linked with the countryside, where we eat produce from the land and spend our free time walking and cycling in a landscape sculptured by centuries of agriculture that so few of us have spent time on farms. Even when you live in a rural area, as I do, there is a division between farmers and the rest of us, which is a real shame. 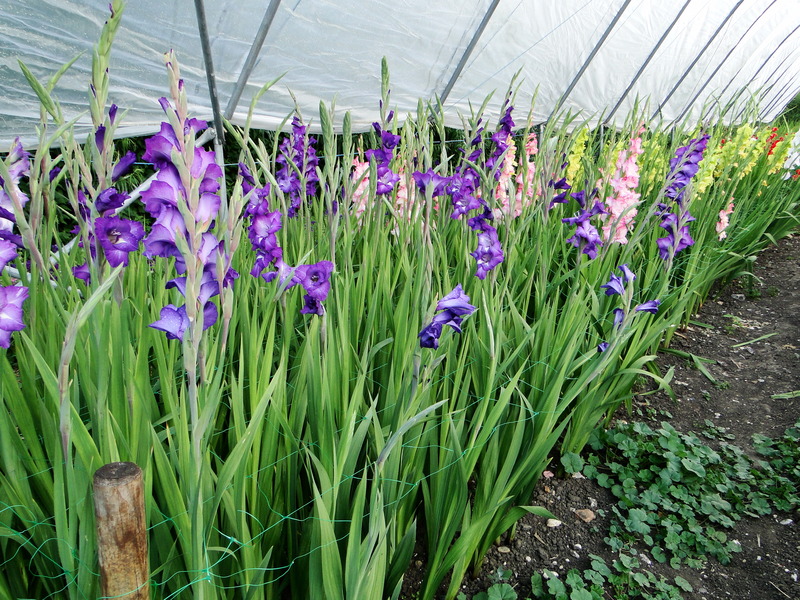 It goes back to my post last week on flower farming where a disconnection means it is harder to appreciate the time and effort that goes into something as fundamental as producing the food we eat. The courses aren’t just aimed at those with land and a smallholding. One course member on the beekeeping day lived in London and was planning to put a hive on the roof of her flat. I always think the test of whether something is a great idea is when people want to return and even in the short space of time Humble By nature has been up and running they have already had repeat visits, Wellyman is planning a spot of hedge-laying and I’m eyeing up one of the foraging courses. It’s a big job that Kate and Ludo have taken on but their passion and enthusiasm is contagious. There’s a lovely, warm, relaxed atmosphere at the farm and situated in an Area of Outstanding Natural Beauty (ANOB) the only sounds all day were birds, buzzing bees, baaing sheep, bleating goats and a tractor. 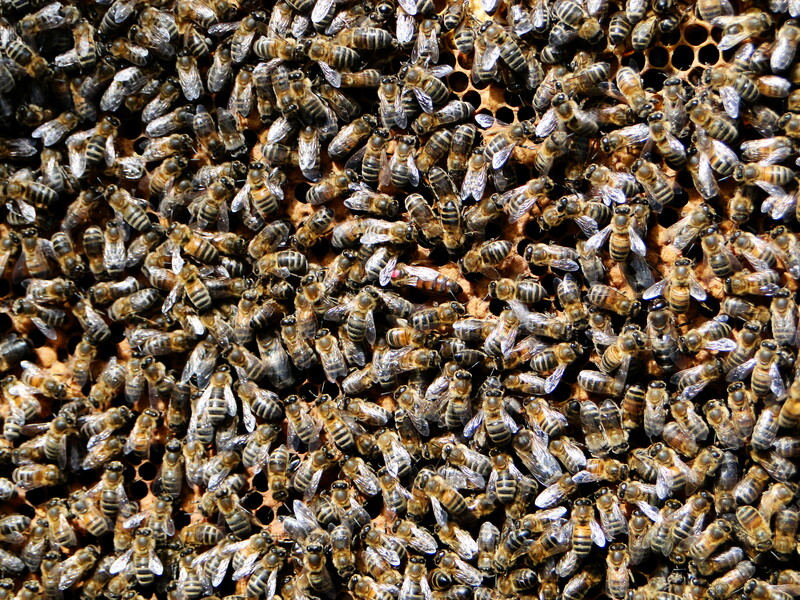 Underneath the capped cells of comb are baby bees ready to emerge. Kate and Ludo have generously offered a free day at Humble by Nature for a course of the winners choice. If you would like to enter the draw just subscribe and leave a comment here and say you would like to be included. The closing date will be two weeks from today on Monday 27th August at 12 noon. I’ll then put everyone’s names in a hat and choose a lucky winner. Accommodation and travelling expenses are not included but Monmouthshire is easily accessible and is a stunning part of the country, so well worth a visit. For more information about Humble By Nature take a look at the website where you can see what other courses are on offer. For more information on Bees for Development. You can also follow Kather’s Kitchen by signing up to her blog to receive news and recipes. ‘Good Luck’ to everyone who enters the draw. You might have guessed by now I’m quite keen on cut flowers, so it was with a fair amount of excitement last weekend I made a visit to one of an increasing number of British flower growers. 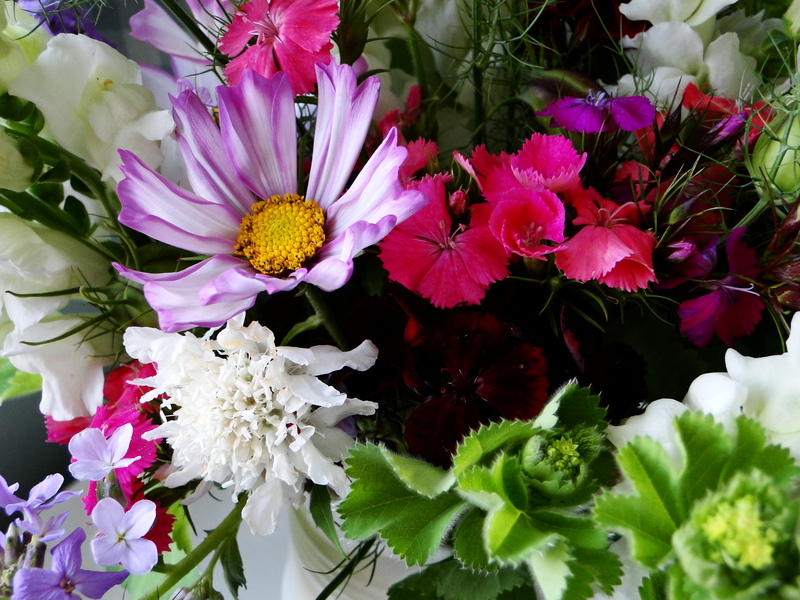 Green and Gorgeous are based in Oxfordshire near the riverside town of Goring and have been growing a wide selection of flowers to sell direct to the public for 4 years now. A partnership between Rachel, the grower and Jo, the florist, provides stunning seasonal flowers grown without the use of chemicals and with no air miles. I was like a kid in a sweet shop surrounded by fields of blooms. My own cut flowers are grown on my allotment in 2, sometimes 3, beds but the scale at Green and Gorgeous was something else. Rachel and Jo take their inspiration from English country gardens and all around were roses, cornflowers, scabious, sweet peas and campanulas. I’d come to get some inspiration for my own cutting patch and with my note-book and camera at the ready there was plenty to fire my imagination. Although, a slightly worried looking Wellyman did point out I don’t have several acres at my disposal. 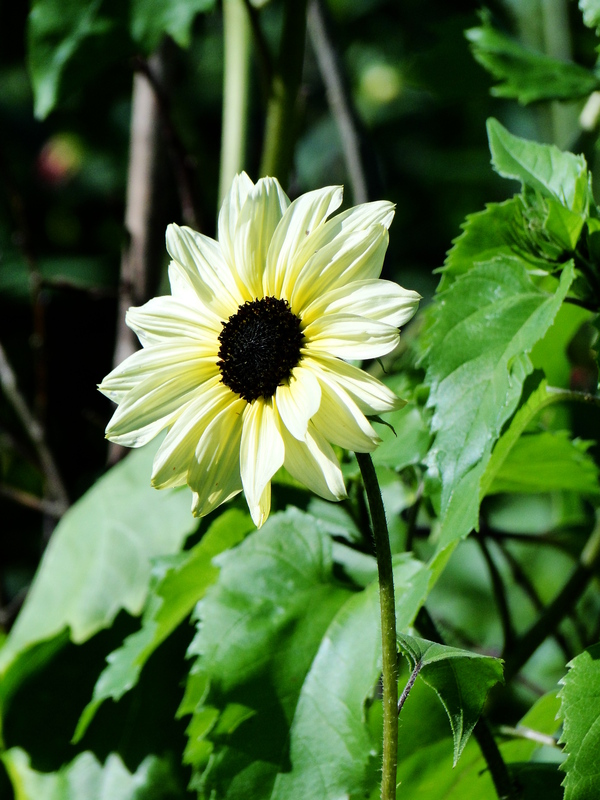 Green and Gorgeous sell their flowers at local farmers’ markets or direct from their site on Saturday mornings, when visitors can walk amongst the flower beds and pick their own arrangement. I loved this idea of bringing the customers so close to the product. Modern ways of shopping for perishable goods may have meant more convenience but they have taken us away from the production processes involved. I believe you value a product more when you have some idea about the time and effort it has taken to grow or make it, whether that’s the fruit and veg on sale at a farmers’ market, clothes made by a dressmaker, furniture by a carpenter or flowers from a flower farmer. The anonymous rose you buy from the supermarket may well have travelled a vast distance and been produced in such a way that the environment and those growing it have been exposed to damaging chemicals. But it’s harder to know this or care when there’s so much distance between you and the production process. Being able to see the flowers growing in the fields, talk to the growers and then select what you want is so far removed from most other shopping experiences and I thought it was an inspired idea. A major part of Green and Gorgeous’ business is weddings and parties, with the option of the flowers being picked, arranged and delivered or their ‘buckets and bouquets’ service where you can do the arranging yourself. They also have a great selection of vases and containers available for hire. 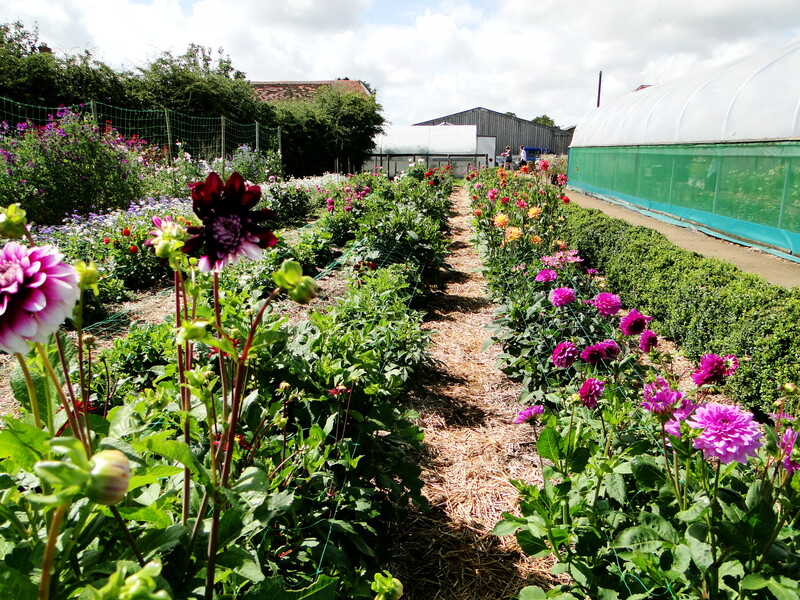 Throughout the year they offer courses imparting their knowledge on growing your own cut flowers and how to arrange them, all set on their magical flower farm. Only 15 miles north of the M4 they are well worth a visit, if flowers is your thing but if you can’t make it to them direct you can still experience a touch of Green and Gorgeous as they also send mail order bouquets. For more information you can visit them at Green and Gorgeous.